Anybody Up For Some CE? Long Classes: Real estate licensees must take three “core” classes (core law, ethics, fair housing/civil rights), each for three hours. That leaves 21 hours of electives that fall conveniently into three-hour blocks. The more hours you can get at once, the fewer times you have to go to a class or log in for online education. Continuing education providers generally offer classes in three-hour blocks. This seems like a positive thing, but sitting for three or six hours for continuing education can be daunting for someone who wants or needs to be out working with clients and going on appointments (don’t forget–real estate agents don’t get paid unless they sell a house). Many agents consider it to be a necessary evil instead of an opportunity to learn something to help their business. Boring Presentations: Many CE courses are taught by industry professionals who know a lot but aren’t good instructors or facilitators. In addition to that, many commit “murder by PowerPoint” with wordy and un-engaging slide presentations. The result can be three hours of boredom. I have seen many agents check out of class mentally and do everything from read a newspaper to check e-mail, post on social media, and text. I doubt much learning happens. Seat Time Rules: It’s not whether you learn something that gains you CE credit, but how long you sit in the class. Managing seat time as a CE provider is much easier than administering tests. If the class is boring or uninformative, you still get the credit as long as you are present for the required amount of time. Interesting Slide Presentations: I don’t want to commit the mistake of putting too much information on the screen. Slides should enhance the material presented. I want the focus to be on the information, not on words on the screen. PowerPoint is fine, but there are other presentation software programs you can use to create wonderful presentations. Varied Teaching Techniques: Not all people learn the same way. Lecture is not the only way to teach. I mix things up with group exercises, instructor-lead training, partner work, video, and short quizzes. I make sure people get up and move around at various times. Groups and teams present the results of their work to the entire class. Current Events and Examples: The information presented in a CE class could be the same from class to class, regardless of who teaches. To make things relevant for the learner, I try to bring in examples and case studies to illustrate the points I’m teaching. In a fair housing/civil rights class, I look for current cases to cite as examples for behaviors agents should avoid. In a class of social media for real estate agents, I look for agents across the country who are doing a good job using social media in their businesses and show their pages/sites/profiles online. Continuing education exists so that practitioners in a profession have the most recent and relevant information in order to work competently in their field. As instructors, we can make the experience of continuing education dull and lifeless or interesting and engaging. It’s up to us. 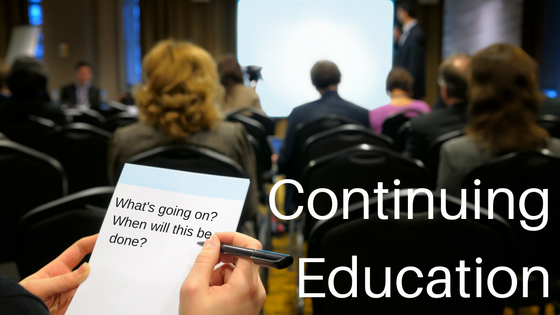 When done well, continuing education can be something licensees look forward to and attend willingly. This entry was posted in Continuing Education, Training and tagged Continuing Education, Instructor Tips, training on November 19, 2016 by Carol Prigan.